Download my FREE ebook about language learning! A step-by-step guide about how to learn a language naturally on your own! Subscribe to my blog (FREE) to download my ebook! Vlog: Post office in the USA! Today we're going to take you on a short trip to the post office! You also get to to see the bus in Milwaukee and a little bit of our neighborhood. Read more for a full transcript! So we're going to take the bus! You're all set, thank you! If it's chocolate, it's mine! Alright what do we got here? Or I guess you would say like "drinking chocolate"
We just want to say: Thank you so much, "wilk"
Hi David. I must admit you do a good job related to your video. It helps me to understand American. Thanks for your video. I hope you'll give more videos on this website. I am happy you give subtitles in English in video. It procure that your videos are easly to understand.. Thanks! Heh, no we just got them yesterday so we've only had a few. :-) "Wilk" really sent us a lot of them! Heh, sorry about the craving. ;-) Glad you liked it! You have nice post office there, really nice building, has so classic American style ... and without a queue inside. When I think about post offices in Poland I always see long queue with many people waiting hours to get their parcel or a letter :) That's why I don't like to get notice from post office unless it's package I'm really waiting for. Thank you David for this video, for me it was really fun to see how you get this package. Yeah, that is a very classic post office. The newer ones could be any office with a front a desk, they don't really look like post offices. Heh, well, we were there for 10 minutes with only one person in front of us. ;-) But we went at a very good time. It was 9:20am on a Monday so everyone had just gotten to work. Around 12pm and 5pm it's the busiest at the post office. Although Americans go to the post office much less frequently than Poles. There just isn't much to do there! I go to pick up stuff at my P. O. Box, but there's no line for that. You can buy stamps at other places. I'm really only ever in line there if I need to mail a package abroad or to the government (otherwise I'd probably go to UPS or FedEx) or if I need to pick up something that wasn't delivered. thanks for the video - but it should include the phrase: "audycja zawiera lokowanie produktu" :P no I'm kidding ;) but it's placed everywhere when ppl present some goods with a clear logo of the company. ah one more thing - it's good to hear that you were so kind to that person who dealt with your note, usually ppl treat them like machines and don't even say "hello" or "thank you". hopefully you've enjoyed the chocolate, and the next video will be about the experience of eating it. Hehe, well, Linguatrek.com is my blog, not my company. If anything is commercial it would be Bibliobird.com. However, I guess it's all connected! I'm glad you liked it. :-) There will definitely be more like this! The content of this field is kept private and will not be shown publicly. If you have a Gravatar account, used to display your avatar. David Snopek is an American entrepreneur, language teacher and learner. On this blog you'll find language learning advice, videos and information about Polish and American culture. Click here to learn more! Subscribe to receive new articles and videos via e-mail as soon as they happen! I created BiblioBird™, a web application for learning languages, based on my experience learning Polish. Watch this video (in Polish) about it! 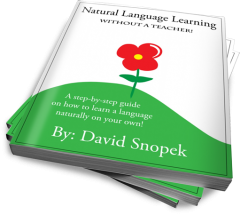 Natural Language Learning (my FREE ebook) is finished!